« Venus Of The Dead! The All-Father rendered in the flesh. We put almost 4.5 hours into this today and still have a ways to go. Odin’s birds are known to be Ravens, but the interesting point of doing them as Swallows was to: 1) Swallows work into the idea of Traditional tattoo imagery more frequently and 2) Swallows are smaller in size compared to Ravens. Their exaggerated-small size really adds to this notion of Odin being more Giant-Size or Godly than of mere mortal stature. 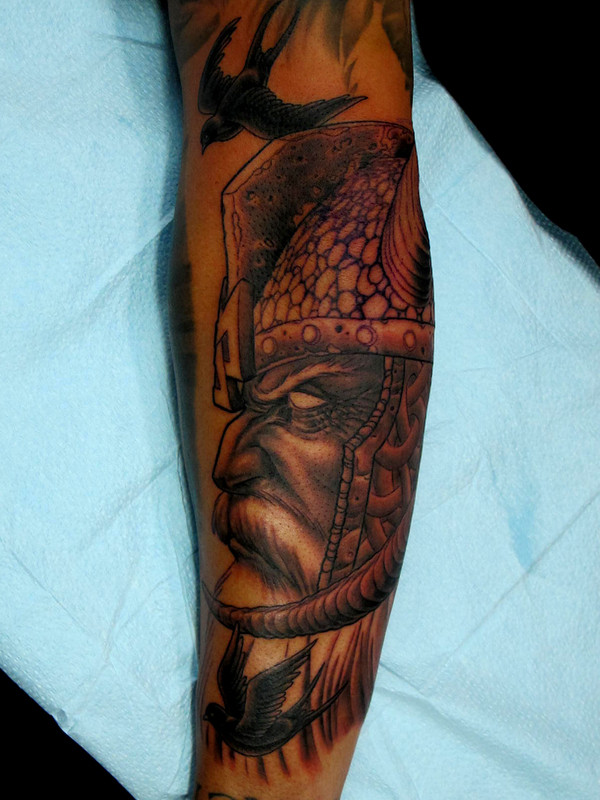 This entry was posted on August 25, 2012 at 11:25 pm and is filed under Tattoo with tags Huginn and Muninn, Norse, Odin, Viking. You can follow any responses to this entry through the RSS 2.0 feed. You can leave a response, or trackback from your own site.